Congratulations to our pharmacy colleagues who are finalists in two categories at this year’s Health Service Journal National Patient Safety Awards. This year has seen a dramatic increase in entries from across the NHS and the wider healthcare industry, making the shortlisting of two entries from RCHT all the more significant. The first of the projects is in the Improving Safety in Medicine Management Initiative. It recognises the work the pharmacy team has been doing to reduce the rate of missed doses of critical medicines and dispensing errors through making best use of new technology an innovative ways of working. The second is the antibiotic stewardship team which has been shortlisted in the Infection Prevention & Control Initiative of the Year category for its focus on avoiding unnecessary antibiotics by reducing course lengths, saving 100s of doses of antibiotics each month which patients no longer needed. 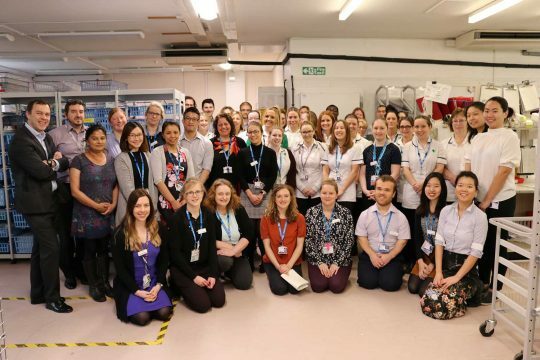 RCHT’s pharmacy team is among 106 shortlisted finalists, across a total of 22 categories, who will be battling it out to be overall winners at the awards ceremony to be held in July. Good luck!